Is there something you need to change, but you’re just too afraid? Join the club and find out why you should do it anyway. It takes a lot to change, and that’s exactly why you should. Read on to discover why. Most people are afraid of change, and the bigger the change, the bigger the fear. Change represents a lot of things to us, like a huge hassle, extreme discomfort, or the unknown. Sometimes, its all three of those wound up together into a tight ball of fear. Recently, I made a HUGE change in my life. I decided to move across the country to California to live with my 90-year- old Mom, to continue my work with Softball Excellence, and to also become the Pitching Coach for the University of California at Riverside (UCR). I was, and still am, scared to death. The fear was so strong that it became difficult to separate it from the decision I was trying to make. In order to make the right decision I needed to be clear-headed and take in all the information and facts, and yet how scared I was to even consider this big of a change blew in a huge fog that at times, completely covered up everything I needed to consider. Change can do that. It can appear to be so incredibly scary or difficult, that we usually just cave in and say, “forget it”. There were numerous times I felt that way, but knowing that my Mom wasn’t getting any younger, that 90 is a pretty tough age (although she’s very healthy for 90), and that this was an incredibly rare chance to coach college pitchers in my hometown forced me to seriously consider this life-altering change. Going through this process made me realize the steps that change involves, and the power that change holds. Change requires that we see future opportunities. Whether you’re trying to change a hitter’s swing, your exercise level, or make a huge life-change like I did, you need to see the possibilities that change can bring. You need to detach yourself from your comfort level long enough to mentally consider the opportunities that lie just beyond the change. 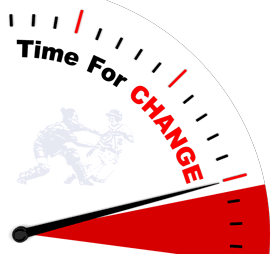 Going through this change has taught me a lot of things – things that I know will help you or your players the next time you face making any kind of change, big or small. Explore Deeply – Take a topic like launch angle, and whether you want to start focusing on it with your hitters. Before you make that kind of an instructional change, you’re going to you have to dive deeply into what it’s all about, and immerse yourself in the pros and cons. Until you deeply explore a topic, you won’t know if making the change is worth it or not. Anytime you diver deeper into a topic and learn more about it, it’s time well spent. And, it just might be the beginning of a change. Mot>Com – No, you don’t need to know algebra in order to make a change in your life, but you do need to know this equation: your Motivation has to be greater than your Comfort! In my case, I was living a very comfortable life in Tampa, living my passion with Softball Excellence, so I wasn’t looking to change. But when this opportunity presented itself, my motivation to be around my 90-year-old Mom became greater than my comfort level. If it hadn’t, I would never have had what it takes to make the change. Imagine Your Change – I think this is the step most people leave out. Your pitcher might be motivated to learn the riseball, but she doesn’t take the time to imagine herself actually having that riseball, and how that will change her game. See yourself in that new position you’re considering; picture how much better your team will hit when they learn that new concept; imagine how much fresher your pitcher will be in May if you embrace that new warmup routine in the Fall. Throw your imagination forward and see if the change would really be worth it. Consider an Alternate Universe to the one you’re living in now. Take Action – And finally, change takes courage. It involves a great deal of faith in your ability to make the new work. Change takes action, it requires you to actually risk failing. There’s a great quote by JK Rowling that sums up the role fear plays in taking action: “It’s impossible to live without failing at something, unless you live so cautiously that you might as well not have lived at all – in which case, you fail by default.” Action for the sake of action isn’t change – it’s simply movement. The comfortable part that lives inside of each of us doesn’t want to change and will battle like crazy to prevent it, but Explore it Deeply, make sure your Motivation is Greater than Your Comfort, Imagine Your Change and then Do It –be brave and take action! The cool thing about doing these 4 steps and actually making a scary change is that doing so is confidence-building, energy-giving, and life-changing! Also, if you’d like to get ALL of our online eLearning products, become a Vault Classic member today and start experiencing ALL of Cindy’s great instruction! Best of luck to you Cindy! Kudos on taking the leap for change. I’m a big fan myself.